The way we pack our belongings into a suitcase can be a hotly-contested topic. Does rolling or folding reign supreme when it’s time to stow clothing? Is it best to pack a few days in advance, or is the night-before shuffle an acceptable option? Is a second piece of luggage worth paying a fee, or should you sit on top of your suitcase and pray that it zips up? And what goes in a carry-on, anyway? 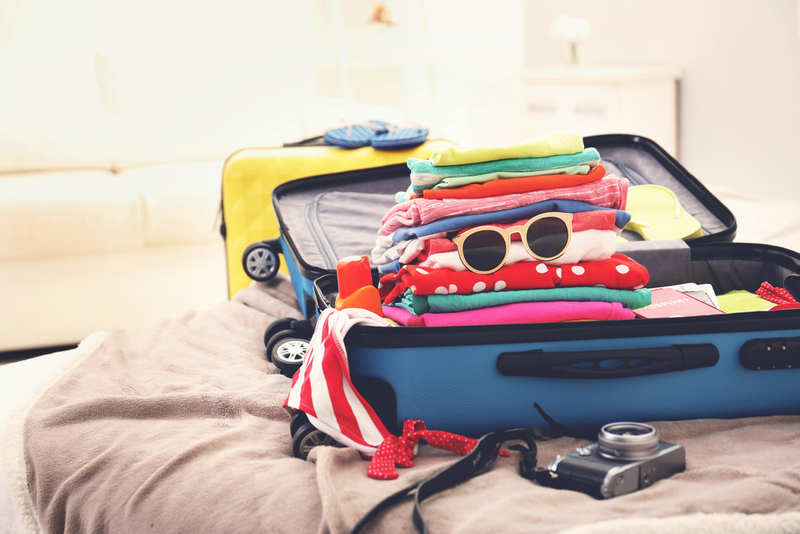 Some things are a matter of opinion, but we would argue that the packing tips below are universal! While it may seem like a tedious task, penning a packing list is the only real way to make sure you’re not forgetting something. You know the feeling of pulling into the airport parking lot at 5 A.M. and thinking, “oh god, my toiletries” – but you wouldn’t if you had made that darn list! If you’re a real list-making professional, you already know that a second opinion can be golden. Bounce your list off someone else to see if they can identify anything you might have missed – two heads are better than one. Have you ever noticed that re-packing your suitcase makes it seem like you brought twice as many clothes as before? To save your future self the headache, don’t fill your luggage until it’s busting at the seams. Leave a little space so that when your belongings inexplicably inflate, you’ll have room to spare. Sure, losing your luggage is a rare occurrence. But boy, will you ever thank yourself when that day does come, and you’ve got a change of clothing packed neatly inside your carry-on. Throw in an extra pair of socks and underwear, as well as weather-appropriate bottoms and a top in case of emergency. Plus, if you’re feeling fancy, you can swap your plane clothes for your spare threads after a long day of travel! It’s day seven of your vacation, and you can officially no longer tell what’s clean and what’s dirty. Shoulda brought a bag. Throw a few plastic bags into your luggage to keep dirty laundry out of circulation. Plus, if you’re heading to the beach, you’ll have a way to keep your wet bathing suit from soaking the rest of your stuff! Layers can come in handy in many, many ways – that’s why they’re a must, both in your carry-on and your suitcase. Is the airplane totally freezing? Throw on a layer. Are tropical evenings much chillier than you anticipated? Pull out that sweater you were convinced you’d never need. Visiting a religious site, but it’s 30 degrees outside so you can’t spend all day walking around with your ankles and wrists covered? Layer, layer, layer. Remember – airport security can and will throw out that brand-new full-size bottle of shampoo, sunscreen, or moisturizer if it’s over 3.4oz and inside your carry-on. Before you zip up your luggage for good, do one last check to make sure all of your liquids are accounted for and safely tucked away. Here’s one last tip: One Stop Parking can offer you the best possible rates on airport parking. If you’re looking to save money on your next adventure, visit OneStopParking.com to find, book, and save on a spot!